There is evidence that a church stood on the site in 909 AD. The present fine building is early Perpendicular and was re-modeled in the 15th Century. The remains of the earlier 13th Century stone-work can still be seen by the piscina. 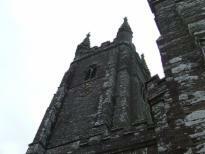 The whole church was extensively restored in 1867 at a cost of £2,600 when the roofs, screen and seating were replaced. It consists now of tower (with belfry), nave, two aisles, parts of the original rood screen, a chapel set apart for the Ilbert family, chancel and a Vicar's vestry added in the 19th century. The square West Tower has three stages with a crenellated parapet which rises to 53 feet supported by set-back buttresses. at the top are four crocketted pinnacles which are unusually 20 feet in height. The 2 light cinquefoiled belfry lights have probably been restored. 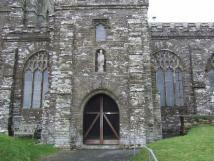 It is entered by a 15th Century 2-centred arched west doorway above which is a perpendicular window. The clock is a memorial for those killed in the 1914/18 war. The six bells were installed by the Ilbert family in 1775, and then rehung in 1877 at a cost of £65. All the money being raised by public subscription. 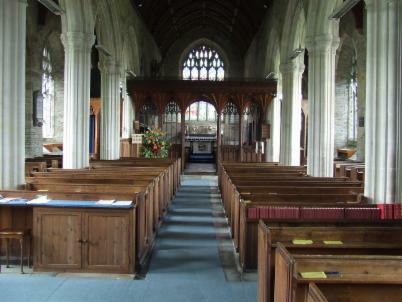 West Alvington for many years possessed a champion team of ringers. The 15th Century 2 story creellated porch has a large round-headed doorway with an image niche above it containing the figure of St Hugh of Lincol with his swan. This was erected in memory of the Revd. Hugh Lethbridge, a former vicar of the Parish. Inside there is a small niche in the left wall, and unusually, a fireplace in the right front corner because the porch was for some time used as the School Room. 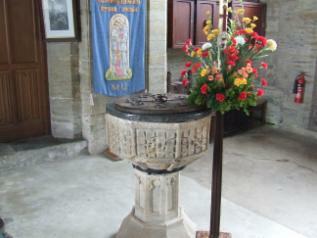 The late medieval 15th Century octagonal font has eight panels, decorated with leaves, surrounding the lead-lined bowl. Four of these are crudely carved and were possibly located to face the wall when the font was originally located under the tower. The supporting column and base are recent additions. The lid of iron-studded oak is probably 19th Century. The Parish Church "All Saints" is a noble 15th century building in the hard green local slate with a fine pinnacled tower. The lofty arcades are of Beer stone brought by water and carried up the hill from quay House Now part of Kingsbridge. What does "ALL Saints" church in West Alvington have in common with St Pauls and Exeter cathedrals, parts of Westminster Abbey, the Tower of London,Hampton Court, Windsor Castle, St Louis Cathedral (Missouri)??? They all use Beer Stone from east Devon. This stone is perfect for carving fine and detailed designs. When carved it possesses a smooth finish that when it comes into contact with the air hardens fivefold and turns a beautiful creamy white. The quarry was first stated by the Romans and only closed in the 1920's. The quarry is open to the public extending to some 73 acres of underground space.